Green coffee beans have become increasingly popular as of late, in fact, they’re now one of the most popular supplements and weight loss products around. They’ve also been associated with a host of health benefits, from protecting the heart and lowering the risk of neurological diseases, to anti-aging effects and more. We also have chlorogenic acid to thank for the high level of antioxidants in green coffee beans which are known to slow the effects of aging. As you grow older, your face is the first area to exhibit the visible effects of ultraviolet radiation, or UV, which can manifest in wrinkles, fine lines, sagging, discoloration and dry skin. Those unwelcome changes reflect the deteriorating condition of the components that make up the inner layer of the skin, which is a combination of the fibrous protein collagen and elastin, along with water-binding glycosaminoglycans. Together, these compounds form a strong, resilient framework of connective tissue that gives the skin its elasticity and strength, for the appearance of more vibrant, younger looking skin. The UV rays from sunlight wreak havoc on the skin by generating the production of free radicals, which break down the vital components of the skin’s framework, and eventually, it results in those tell-tale signs of aging. 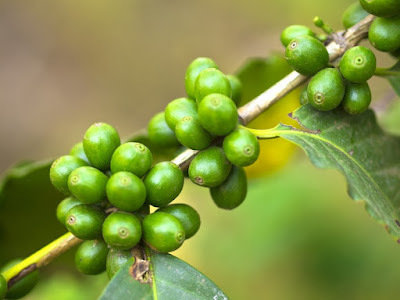 Green coffee beans help to rejuvenate it again, to improve the texture and firmness of the skin as well as reducing redness and the appearance of wrinkles. A recent study out the Nutritional Neuroscience and Aging Laboratory at Pennington Biomedical Research Center in Baton Rouge, Louisiana, published in the Journal of Nutritional Neuroscience found there is increasing scientific evidence that the chlorogenic acid in green coffee beans can lower the risk of degenerative brain conditions. Coffee, in general, has been shown to reduce the risk or delay the development of Alzheimer’s and other brain aging diseases in numerous studies. It may even delay the onset of Alzheimer’s in those who already have some form of mild dementia. Research has shown that caffeine blocks inflammation in the brain, specifically adenosine receptors, which can start a chain reaction that begins the mind’s cognitive decline. It’s also been found to have such a positive effect on inflammation in the brain, that adults who were 65 years of age or older with higher levels of caffeine in their blood, were found to avoid or delay the onset of Alzheimer’s. Caffeine also has a positive effect on tau protein, which has been very closely linked to Alzheimer’s. The buildup of this protein is present in the brain scans of people with the disease, and it’s believed that it can actually kill brain cells, leading to cognitive decline. Caffeine blocks some receptors in the brain that contribute to the buildup of tau, as it’s considered an adenosine receptor antagonist. Researchers believe their findings even have the potential to lead to a new class of drugs for treating this devastating brain disease. While green coffee beans have a long list of scientifically documented benefits, that doesn’t mean it’s for everyone. And, if you plan on using it to help you lose weight, it’s unlikely to make much of a difference unless you’ve also made some major lifestyle changes, like getting regular exercise, 7 to 8 hours of quality rest each night, following stress reduction practices and consuming a healthy diet. Another issue to consider is that there is no standardization when it comes to supplements. That means that manufacturers don’t have to follow a specific formula, so one green coffee extract product could be made completely differently than another, and one brand might contain a lot more caffeine than the bottle next to it. That’s concerning because concentrated doses of caffeine can lead to anxiety, insomnia, nervousness, stomach upset, headaches and irregular heartbeat, or even more serious problems in some people who are more sensitive to it. Using supplements that contain caffeine and then stopping them has also been linked to withdrawal symptoms like a headache, fatigue, depression, trouble concentrating, nervousness and muscle tension. These supplements can also react with others that you’re taking, such as guarana, which can trigger a synergistic effect that may raise blood pressure to dangerous levels. A high caffeine intake can also lead to the loss of magnesium and calcium, and many prescription medications also have interactions with caffeine, including everything from antidepressants to blood pressure and diabetes drugs. If you have a history of heart problems or being sensitive to caffeine, you should not use green coffee beans, or any caffeine-based supplements or drinks, as it can lead to or aggravate heart rhythm abnormalities. Those who are pregnant, breastfeeding, have been diagnosed with an anxiety disorder, have a bleeding disorder, glaucoma or high blood pressure should speak with their healthcare provider before use. If you notice any of these symptoms, stop using green coffee beans immediately, and speak to your healthcare provider for advice. WebMD advises: Green Coffee is possibly safe based on the limited research that has been done in people so far. In clinical research, no serious side effects were reported when green coffee or green coffee extract was taken by mouth at appropriate doses,” however, the site also warns that there has not been enough situational evidence to identify potentially dangerous side effects from the supplement.